Custom Metal Roofing From RoofCrafters, Inc.
As a general category, metal is among the toughest and most durable of all the materials ever used for roofing. Metals which have been used for this purpose include steel, copper, zinc, aluminum, and lead. Dating back thousands of years, copper roofs are well known for their appearance, corrosion resistance, and durability. In Europe, copper roofs installed on cathedrals have lasted many hundreds of years; and in theory, it is possible for a well designed, properly installed, and consistently maintained copper roof to last a thousand years. 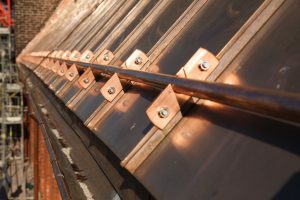 Besides durability, copper roofing offers attractive levels of thermal efficiency, being especially effective at reflecting radiant energy coming from the sun. In addition, copper’s thermal emittance (its ability to radiate absorbed heat) is excellent. Although copper roofing is expensive, it has always been a premium option for public buildings, and high end homes. If you choose a copper roof, be sure to select a top-of-the-line, trusted product and installer who is experienced and well equipped for all types of copper roofing fabrication and installation, including copper flashings, roof tops, dormers, and steeples. That way your investment will last as long as your home or business. Among the roofing metals which remain in use, steel is by far the most popular roofing material available today. 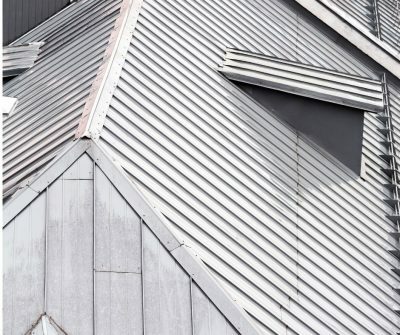 The many new forms we’re seeing for steel roofing materials make steel especially interesting. In the beginning, there was only one type of steel roofing. Invented in the early Nineteenth Century and known as corrugated tin, or CGI (corrugated galvanized iron), it is still in use nearly 200 years after it first appeared. Although it was sometimes painted, CGI’s standard appearance is an uncolored, bright metallic look, which weathers to a vintage gray patina over time. Having replaced CGI in popularity for residential steel roofing, standing seam steel roofing is available in a number of locking seam styles, including single lock, double lock, and snap lock panels. 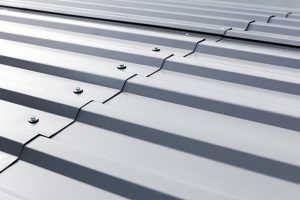 These panel-to-panel locking systems have vastly improved metal roofing’s resistance to wind and rain, making standing seam steel roofs far more watertight than corrugated steel roofs. That’s because their tightly locking seams don’t involve exposed, through-hole fasteners like those used for corrugated steel. To prevent water leaks through the fastener holes on corrugated steel roofs, a rubber washer is installed under the head of each screw. In ten to twelve years, thermal cycling from boiling hot roofs in summer and freezing cold winter temperatures breaks down these rubber seals, after which leaks will develop. Leaks can occur even sooner, if rubber seals are lost or damaged by over-tightening during the install. The best repair solution for corrugated roofing leaks involves replacing all the fasteners with larger screws and seals. However, this procedure can only be applied a few times. When considering the inevitable problems associated with corrugated roofing, it’s easy to understand why standing seam roofs have become so popular. Another reason for their popularity is the wide array of tough, durable colors and finishes being offered by manufacturers. Rated for fifty years or more, it’s impossible to say how long these steel roofs will actually last. Barring disasters like house fires and tornados; with good maintenance, it’s not difficult to imagine a standing seam metal roof lasting a hundred years or more. Just when we thought all the new colors available for steel roofs were providing every option anyone could want, SCS (stone coated steel) roofs entered the U.S. market and really made things interesting. While stone coated metal roofing was first introduced during WWII in the UK, more recent refinements made it both beautiful and functional for residential markets. That’s because SCS has introduced an exciting array of new shapes and textures, as well as an attractive palette of rich and varied colors. SCS can give you the look and durability of tile, without the need for extra attic supports to hold the tons of extra weight you’ll have with a conventional tile roof. SCS is also manufactured with the appearance of thick cedar shakes, without the cracking, leaking, and fire hazards associated with wood roofing materials. If you prefer the lower profile appearance of shingles, SCS can provide that also, along with a 120 mph wind rating and significantly better fire resistance.